It started as a small idea and it has blossomed into one of the most celebrated gardening events of the season. Cornwall Seedy Saturday returns to the Benson Centre for its fifth year on Saturday, March 16th from 10:30 am to 2:30 pm. Hosted by the Transition Cornwall+ Food Action Group and coordinated by Allspice Solutions, this free community event welcomes all gardeners looking to purchase seeds for the new season, ask questions, learn new tricks, and swap seeds with other growers in the community. “We never imagined this event would grow so big in just a few years! 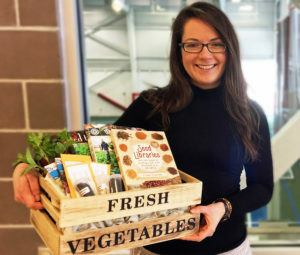 Celebrating our fifth anniversary just shows how quickly the community has developed an interest in home gardening and local food,” explains Kat Rendek, Allspice Solutions and event coordinator for Transition Cornwall +. Compared to previous years, this year’s event will offer an even bigger variety of seed and gardening vendors, local food vendors, and community exhibitors. Organizers have also planned for a more interactive learning experience through a dozen on-going activity tables and six free workshops. The activity tables and workshops will cover topics like seed starting, garden layouts, composting and mulching, upcycled garden supplies, and edible landscaping. The famous “Ask a Gardener” table, hosted by the regional horticultural societies, will also offer support for those looking for more personal gardening advice. Admission is free however donations are welcome. Donations will help to support future events by Transition Cornwall+ Food Action Group. This event has been made possible through partnership with the Social Development Council of Cornwall and Area, and sponsorship from the City of Cornwall and the Cornwall Kinsmen Farmers’ Market. For additional information on Seedy Saturday, please visit www.transitioncorwall.com.